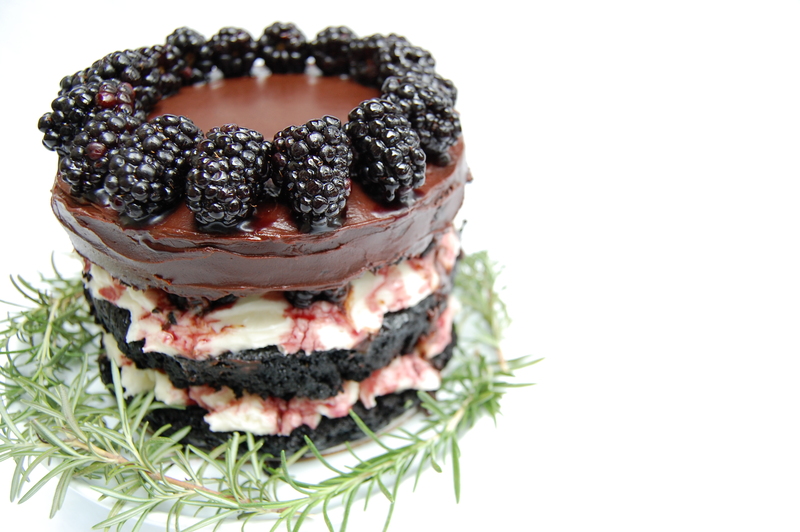 a birthday black(berry) forest cake for molly yeh! molly’s love for wine is among the things i learned after meeting her at the cold mountain retreat in asheville. i contemplated attempting an immaculately frosted cake – adorned with marzipan, in molly’s signature style – to celebrate her twenty-sixth birthday. instead, i decided to make a cake that i can picture the two of us getting drunk off of in her (soon to come) cake house in grand forks. while listening to classical music and eating hot dogs. it’d be great. 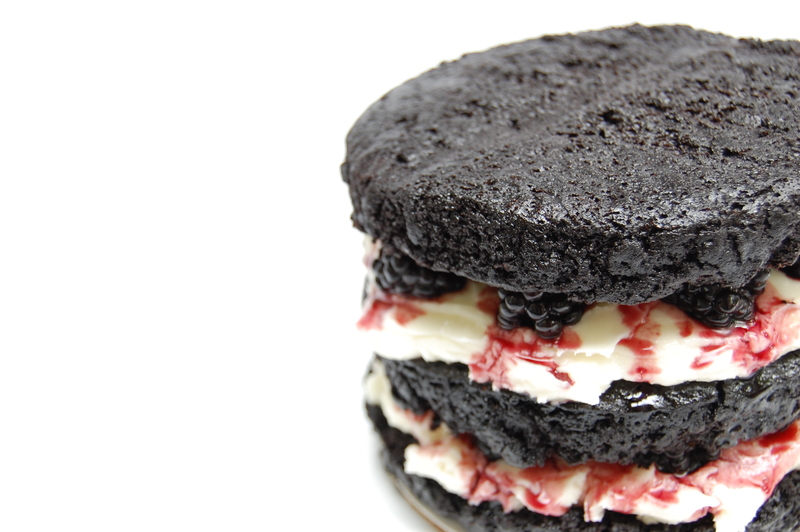 this ‘gâteau’ is a take on a black forest cake, with blackberries instead of cherries and red wine in lieu of kirsch. 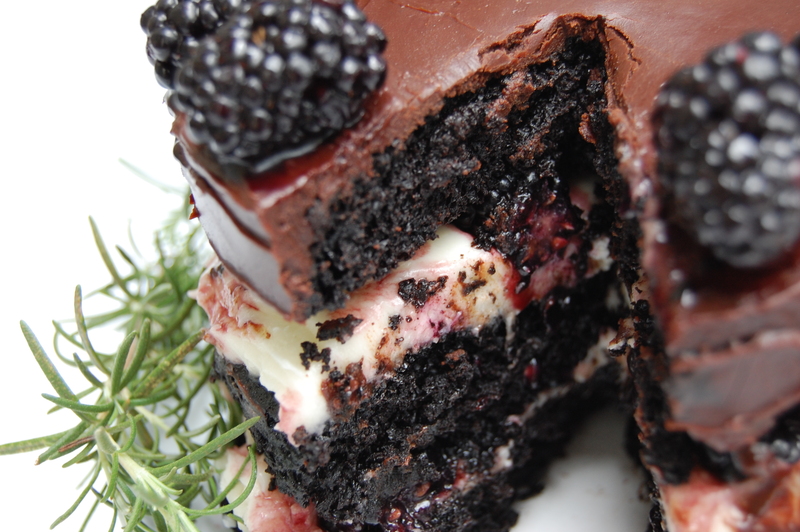 dark chocolate layers are drenched with a sugary wine reduction, filled with mascarpone cream, and topped with chocolate ganache and macerated berries. the first cake of molly’s i fell in love with was her vanilla rosemary cake with blackberry preserves and mascarpone frosting, so i thought it would be appropriate to make something using the same ingredients. this is also very much inspired by the lovely thalia from butter of brioche. preheat oven to 300º and grease three 6-inch cake pans. line with parchment paper and grease again. combine the chocolate and the coffee, and let sit until the chocolate has melted. stir and set aside. sift together the sugar, flour, cocoa, baking soda, baking powder, and salt. in a separate bowl, beat the eggs until thick and lemon colored. add oils, buttermilk, vanilla, and chocolate/coffee mixture. add the flour mixture and beat until combined. bake for 40-50 minutes, then let cool for 10 minutes still in the pans. invert pans onto a rack and let cool completely. beat cheese and sugar together until fluffy, 1-2 minutes, then add cream 1 tbsp at a time until mixture is smooth and silky. bring wine and sugar to a boil in a saucepan, then reduce heat and let simmer for 30 minutes, until thick and syrupy. heat cream until almost boiling, then pour over chocolate in a heatproof bowl. let sit for 5 minutes, then stir until smooth. place one cake layer on a cake board or a 6-inch piece of cardboard. brush with a generous amount of the red wine reduction, then pile on mascarpone cream and berries. repeat with the second layer. top with the third layer, and spread with the chocolate ganache, allowing some to drip down the sides. 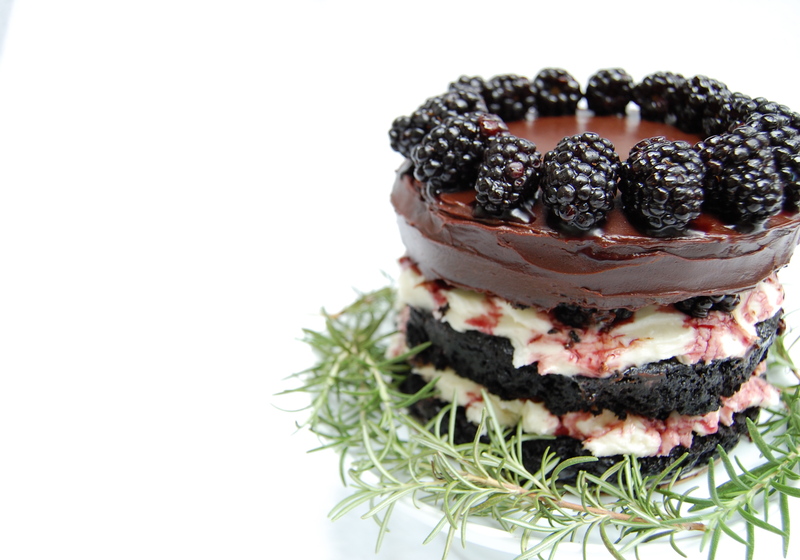 garnish with more berries, sprigs of rosemary, and a sprinkling of icing sugar, if desired.